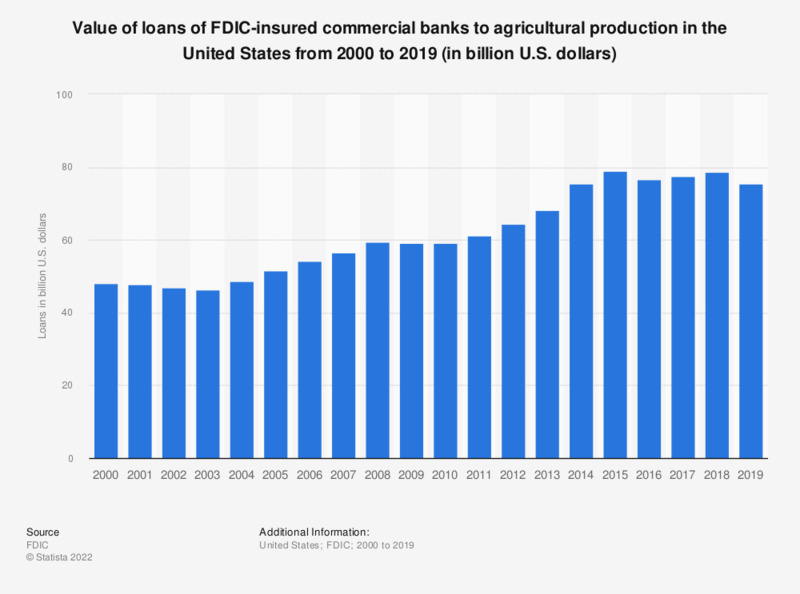 The statistic presents the value of loans of FDIC-insured commercial banks to agricultural production in the United States from 2000 to 2017. In 2017, the value of loans of FDIC-insured commercial banks to agricultural production amounted to approximately 77.39 billion U.S. dollars. FDIC stands for Federal Deposit Insurance Corporation. FDIC-insured commercial banks include the following categories of depository institutions insured by the FDIC: national banks, state chartered banks and trust companies (except savings banks), commercial banks, either national or state chartered, insured by the FDIC, other financial institutions which operate under general banking codes, or are specifically authorized by law to accept deposits and in practice do so or the obligations of which are regarded as deposits for deposit insurance. The statistic does not include figures for Guam, Puerto Rico, Virgin Islands, and all other United States territories and possessions. Statistics on "Commercial banks in the United States"
Commercial banks in the U.S.